A 45-year-old man was shot dead near Boston University Friday by a Massachusetts state trooper after he allegedly threatened police with a knife, police said. The man, identified as Santos Laboy of Somerville, Massachusetts, had a long record and outstanding warrants, the Suffolk County District Attorney's Office said.. After the incident, the man's body remained under a tent on the Silber footbridge over Storrow Drive which connects the Esplanade to Boston University. The incident happened at 2:20 pm ET Friday, after police say the man threatened and approached the uniformed trooper with a knife, and refused to drop it. "He went out on Storrow Drive at one point back onto the other side of the Esplanade again and at one point ran up onto the Silber Way footbridge," said Mass State Police Superintendent Tim Alben. 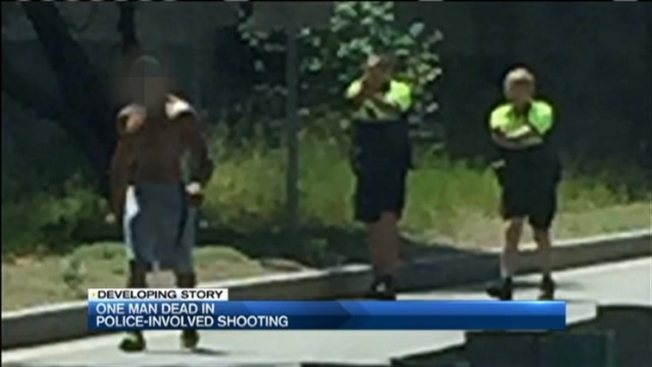 "We saw a shirtless guy running around, left to right, and then it looked like at one point he was going to hop the fence," said Kenny Elas, an eyewitness. Other eyewitnesses, who didn't want to be identified, say the man did hop a fence. "He was in the middle of traffic running and he hopped on top of cars and then hopped over the fence." As for what lead up to the shooting, investigators say BU Police were looking for a man with what they call a lengthy rap sheet and outstanding warrants out of Roxbury District Court. They say they found him in the Esplanade area, where he's known to frequent, but when they went to confront him, he allegedly ran away. Boston University police called State Police for backup. Eventually it was the trooper, coming across the footbridge in the opposite direction, investigators say, who fired the fatal shots when he was threatened with that knife. "I don't know how he got on top of the bridge, it happened really fast, but next thing we know when we looked up there was a cop with his gun drawn and see him get shot like three times," said Samantha Bordeaux. No police were hurt, but the trooper was taken to the hospital which is mandatory according to police.